The United Kingdom has expressed satisfaction with the successes recorded so far by the Armed Forces of Nigeria in the tackling of Boko Haram insurgency in the North East and promised to collaborate with Nigeria for further success. The United Kingdom Assistant Chief of Defence Staff, Rear Admiral Simon James Ancona made this expression when he led a delegation of the UK Ministry of Defence and Engagement on a courtesy visit to the Nigeria Chief of Defence Staff, General Gabriel Olonisakin. Ag Director Defence Information, Brigadier General Rabe Abubakar, said in a statement released that Rear Admiral Ancona reiterated the way Nigerian military subdued the Boko Haram terrorists has further put the Nigerian Armed Forces in particular and the nation in general on a positive radar of global assessment index. He commended the military and allied security agencies for their doggedness and sacrifice that have led to the decimation of the murderous terrorists group and called for sustenance of the onslaught to wipe insurgency from our land. The senior military officer pledged that the UK Armed Forces would continue to work closely with their counterpart in Nigeria towards strengthening the capacity of the Nigerian military to be more potent and responsive in the discharge of their constitutional mandate. The UK team leader explained that the delegation was in Nigeria as a follow-up to variety of regional and global security matters discussed earlier in the year at a Peace Keeping Conference held in the UK. 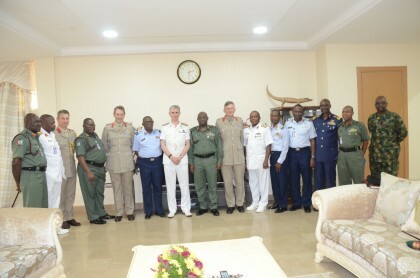 The visit, he said, would further strengthen and improve the historic and harmonious bilateral relationship between the two great nations, assuring the CDS that British contingent in Nigeria would always abide with extant rules and operations mandate of troops in Nigeria.